“A World Apart” is not your typical bare provisioned rental cabin locked away in a subdivision overlooking more houses than views. 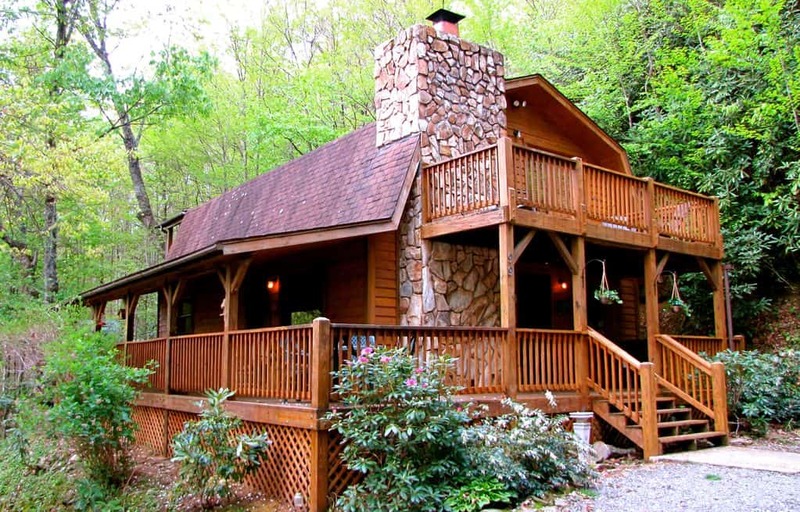 Its location was selected and the home painstakingly built by our family to take advantage of the best of Maggie Valley and Western North Carolina. The care and attention to detail is visible throughout. Our home is located at 4000′ elevation in the mountains and would NOT be easily accesible by motorcycle. Even though our property has plenty of parking and room for cars, trucks and trailers, riding by motorcycle will be up to the comfort level of the rider. The road leading to our property is made up of dirt/gravel and may not be suitable for every rider. Nestled on 6 secluded acres of Soco Mountain, our home offers a Romantic Oasis for Couples or the perfect Retreat for Families. Relax on the Wrap-Around Porch and unwind while enjoying the scenery and listening to the persistent harmony of the Creek winding through the valley below. If you’re still and quiet, some of the neighborhood hummingbirds might visit and perhaps even an owl or two will announce the arrival of dusk. The downstairs of our home features a magnificent Stone Fireplace towering over the living room, Satellite HDTV with DVD, broad-plank hardwood floors, queen sleeper sofa, slate bathroom with Antique Claw-Foot Tub and walk-in shower. The Queen Bedroom features a large armoire, Satellite TV/DVD/VCR, and its own door leading to the hot tub. A fully-equipped and well-stocked kitchen with slate countertops and peninsula bar in addition to the dining table for six offers plenty of seating and amenities for your family gathering. Screen doors and windows allow for Mother Nature’s ventilation and the sounds of the wilderness without being visited by it. Upstairs the loft features a pool table and French Doors that open onto a Covered Porch complete with Dining Area. In the Master Suite, unwind in the slate-surround Jacuzzi Tub while gazing out at the mountainside or enjoying the soothing embers of the electric fireplace. Satellite HDTV with DVD invites you to just lounge in the pillow-top King Bed watching a movie. The French Doors from the Master open onto a Large Private Balcony that is the perfect place to enjoy the morning’s first cup of coffee.